You want to start dating. Maybe you’ve already had a few coffee dates with several men. 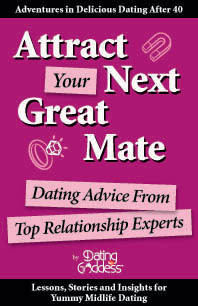 You want to be as successful as possible on your dating adventure. 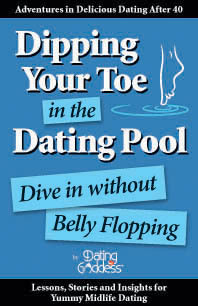 Dipping Your Toe in the Dating Pool: Dive In Without Belly Flopping focuses on getting started on your dating adventures. We cover what you need to know as you begin your journey. We discuss questions commonly asked by those reentering the dating scene after years (decades?) of absence. Do you have the right datewear? Are you making bad decisions out of loneliness? When do you feel most vulnerable in dating? Are you out of his league — or he yours?